Filling up the gas tank often requires a quick trip inside of the station where a customer can browse the displays for a snack. Besides the usual candy, chip displays and oversized sodas, more consumers are grabbing hot food items. The latest hot seller is delicious pizza – by the slice or convenient small pie. Convenience store and gas station pizza may not immediately sound appealing, but consumers are buying them up. According to the market research company the NPD Group, the amount of pizza dough shipped to convenience stores shot up by 27 percent in just one year. Convenient store pizza has become the dark horse of the pizza market, riding past conventional competitors at a speed no one could have anticipated. 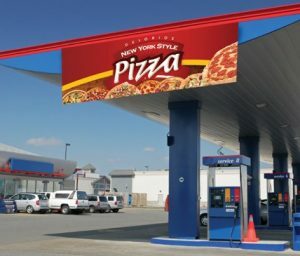 The National Association of Convenience Stores (NACS) stated that Casey’s General Stores, a convenience store chain, is the fifth-biggest pizza seller in the United States — situated behind Dominos, Pizza Hut, Papa John’s and Little Caesars, respectively. So how exactly did these unconventional pizzerias find an audience? One way they have accomplished this is by emphasizing quick service and expanded food offerings. Competing directly with fast-food chains, convenient stores have revamped their image into one where customers come specifically to purchase their hot food selections. A great success story within the niche is The Hunt Brothers. They have capitalized on America’s need for a quick, no-frills, and ultimately tasty bite to eat. They license their pizza to be sold at thousands of convenient stores and gas stations, therefore saving money on operating their own restaurants. Expanding their customer base by making service a priority has also increased profits. A simple and convenient place to grab a slice while filling up the gas tank, millennials are flocking to the cheap and delicious option. Convenience stores have managed to attract a new target market while still retaining their old customer base. Overall, this segment according to NACS racks up approximately $700 billion in annual sales from more than 150,000 retail stores across the nation. There are about 95,000 operating companies representing two-thirds of the convenience store industry. In addition there are about 1,800 chains with 54 percent of the Top 100 chains stores made up of franchisee and licensee stores (about 32,000 stores). The total locations are impressive and definitely warrant concern from pizza chains. 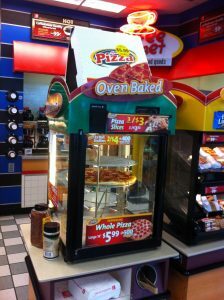 Just because pizza is being sold in a convenience store or gas station does not mean that they are inherently sacrificing quality for convenience. These salivating slices are on the rise, leaving the convenient store slice as a competitor not to be easily dismissed.